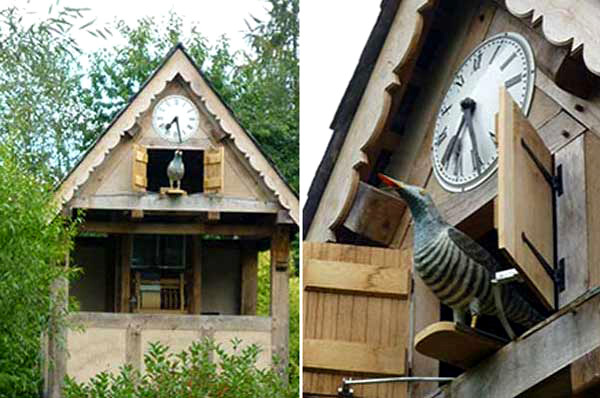 The world’s largest water-powered cuckoo clock, built by Richard Pim for his Westbury Mill water gardens in Herefordshire, features a birdsong barrel organ from the W & A Boggis organ building firm. A few minutes before the hour the doors open below the clock dial and the cuckoo emerges. It sings on the hour, and two minutes of bird song from the barrel organ follow. The valve for opening and closing the water supply to the driving wheel is controlled by two alternately emptying and filling Guinness cans. This according to “The world’s largest singing bird? A garden folly in Herefordshire” by Christopher Proudfoot (The music box: An international journal of mechanical music XXVI/6 [summer 2014] pp. 230–231). Above and below, the clock in action. BONUS: A closer look at the inner workings.